20s & 30s – Let’s Charleston! Let me take you back to the golden age of film and song with many classic melodies, written by the iconic song writers, Berlin, Gershwin, Warren, Porter etc. Let me teach you some Charleston moves as we dance to the Sounds of Fred Astaire and Ginger Rodgers. 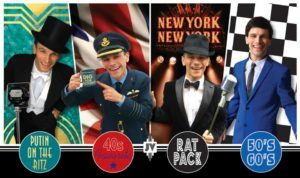 “Bye Bye Blackbird, The Charleston, No Business Like show business, Putting on the Ritz, Cheek to Cheek , Anything goes, It had to be You, Mammy, S’wonderful” are just a few of the songs to feature…..
Music from the Iconic period of the wartime years evokes so many memories. Dance to the sounds of the Dance Hall, jive to Glenn Miller and sing-a-long to the silly wartime songs we all love. “In the Mood, Boogie Woogie Bugle Boy, Sing Sing Sing, Swingin’ on a Star, Sally, Underneath the Arches, Bless ’em All, We’ll Meet Again, When I’m Cleaning Windows, Always be an England, All of Me, I’ll be seeing you, Wish me luck as you wave me goodbye” and so many more……. The American influence was massive in the 50s and many heart-throb idols were born. You’ll find a mix of Dreamcoats and Petticoats alongside some great Rock and roll tracks. “Rock around the Clock, Teenager in Love, At the hop, Lipstick on your collar, Summer Holiday, Bye Bye Love, Wake up Little Susie, Just walkin’ in the rain, Halfway to Paradise, Everyday, Dont be Cruel, Return to sender, Dream Lover” and more……. 60s – Swingers – Yeah Baby! Yeah Baby! Lets groove to some great sixties songs and lets do those funky moves. “Sugar Sugar, Save the last Dance for me, Twist and Shout, I’m a believer, Hello Mary Lou, Poetry in Motion, Delilah, Runaround Sue, The locomotion, Downtown, Puppet on a String, Rubber Ball, Blue Velvet” and more…..
Dean, Frank and Sammy really set this period swinging with some all American Classic tunes. Don your tux, order your martini and lets go to Vegas! “fly me to the moon, Aint that a kick in the Head, You’re just too good to be true, You make me feel so young, Moon River, New York New York, My Way, Candyman, That’s Amore, Come fly with me, The Tender Trap, the way you look tonight, Something Stupid, The lady is a Tramp” and more…. How about a mixed programme across the decades? I can perform an hour set for homes or a whole evening across the 20s-60s. If its a whole day or evening event I can change costume for each period to help set the mood even more…. I am always learning more repertoire, so please let me know if there’s anything you want to hear… or a particular show you’d like to see.